In Woodworking. A cheap metal bench that when fitted with a hand held power saw, makes a useful cheap, portable bench saw. Also known as a Triton Workcentre. This is a particularly Australian idea. 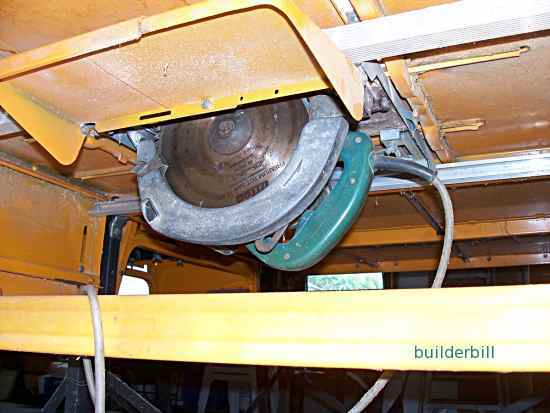 Using a standard 225mm power saw, bolted upside down in a demountable metal saw bench. The Triton company makes quite a few accessories for woodworkers, but this one would have to be their biggest hit. It will accept just about any hand held power saw and turn it into a fairly decent saw bench. It has the safety features of a dedicated bench, like a good on off switch and a riving knife, along with a fairly finicky fence setting. 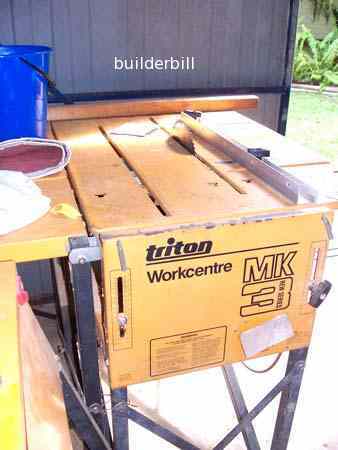 A good compromise for DIY-ers and also a lightweight (knock-down if necessary) unit for builders and tradies to take onto work sites. The newer models have a far better fence system and the top blade guard has the facility for hooking up a shop vacuum for dust collection. The reason that these things sell and are so common is the huge amount of people that already own a power saw but do not have the money to buy a fully fledged bench saw. It is beyond dispute that a saw bench is very convenient for an awful lot of sawing work. Ripping is a breeze compared to using the saw hand held. Triton have expanded from the basic bench to also making a similar thing for routers. The same idea and a router mounted under the bench is transformed into a far more useful tool without a lot of extra expense.